North Dakota Health Care Directive (POA & Living Will), also referred to as an ‘advance directive’, allows an individual to designate an agent to make health care decisions when he or she cannot communicate with his or her medical providers. Some scenarios where this paperwork should come into play include principal being unconscious, drugged, or heavily traumatized. Chapter 23-06.5 of the North Dakota Code sets forth the criteria for this directive and this form has been developed to remain compliant with this Code. 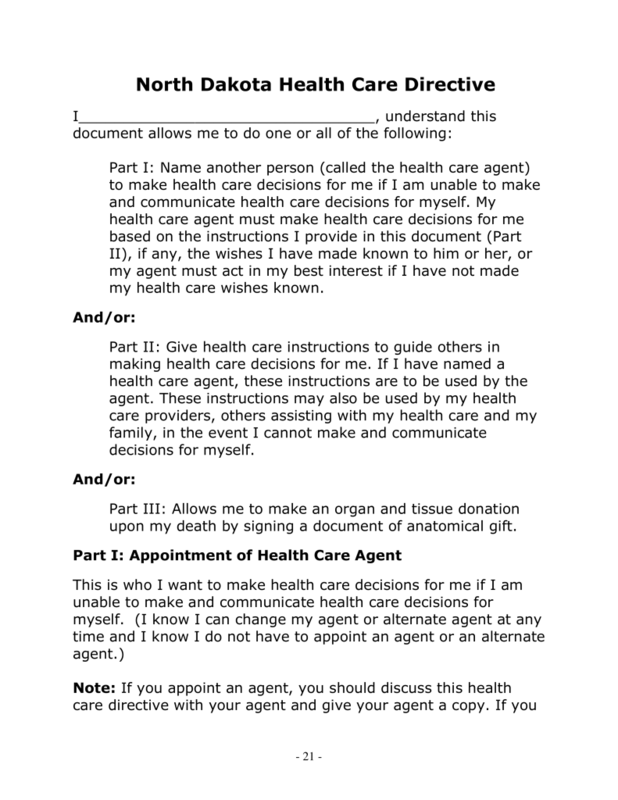 This form allows you to also specify your medical care preferences (known as a living will). This is something optional. Durable (Financial) Power of Attorney – This document assigns an attorney-in-fact to act on behalf of the Principal as their financial representative. Download the paperwork on this page. It will provide the structure and language required to assign a Health Care Agent with the Principal Authority to make Health Care Decisions on behalf of the Principal in a variety of circumstances. It is available in one of three file formats as labeled by the buttons underneath the image. Select any of these buttons to download this form. The first paragraph will begin a formal declaration of Health Care Agent assignment. First, furnish the First, Middle, and Last Name of the Principal. All parties involved should read the passage provided here. The next area requiring attention will be a list of the Decision-Making Powers and Actions the Health Care Agent will have the Principal Authority to engage in on behalf of the Principal. 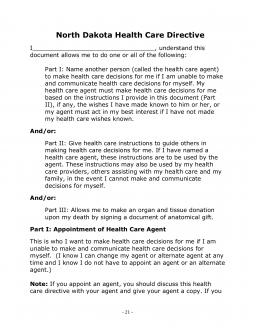 By default, the Health Care Agent will be able to “(A) Make Any Health Care Decisions” for the Principal, (B) choose the Principal’s Health Care Providers, (C) Choose where the Principal lives and receives Health Care, and (D) access and review any of the Principal’s Medical Records at-will as if he or she were the Principal. If the Principal wants to limit the Health Care Agent’s Principal Powers, then he or she should make such limitations or restrictions known. They must be reported using the blank lines below this list. Make sure when providing this report to do so by calling out the corresponding letter (A through D) to the Power Designation that should be restricted from Health Care Agent use. If the Principal is an organ donor then in “Part III: Making An Anatomical Gift” he or she should initial one of the statements provided to indicate his or her preferences. If the Principal is willing to donate any of his or her organs and tissues, the first statement should be initialed. If he or she only wishes certain organs, tissues, or body parts to be available for organ donation, the second statement should be initialed by the Principal and the authorized donated organs/tissues/body parts should be documented on the blank line. The Principal must attend to the final section, so this Health Care Appointment can be executed. In “Part IV: Making The Document Legal,” the Principal should enter the Date he or she is signing this document on the blank space just after the statement “I Sign My Name To This Health Care Directive Form On…” Below the Execution Date just recorded, the Principal should supply the name of his or her City and State of Residence on the line labeled “City” and “State” (respectively). On the line just over the words “You Sign Here,” the Principal must sign his or her name. The next segment of this paperwork will give the Principal the opportunity to choose how this document may be substantiated as true. The Principal Signing must be either Witnessed by two individuals. If the Principal Signing will be Notarized, the Notary Public should be directed to the section title “Option 1: Notary Public.” If the Principal Signing will be verified by two Witnesses, each Witness should direct his or her attention to the section labeled “Option 2: Two Witnesses” where each Witness will have one area to tend to (“Witness One” and “Witness Two.” Each Witness must physically supply the Execution Date and Name of the Principal in the first statement of his or her respective section. Once done, the appropriate Witness must sign the Witness Signature line and document his or her Address, just below the statement. The Health Care Agent will also have to participate here. He or she should read the passage titled “Acceptance Of Appointment Of Power Of Attorney” then, Sign and Date the blank lines supplied at the end of it.